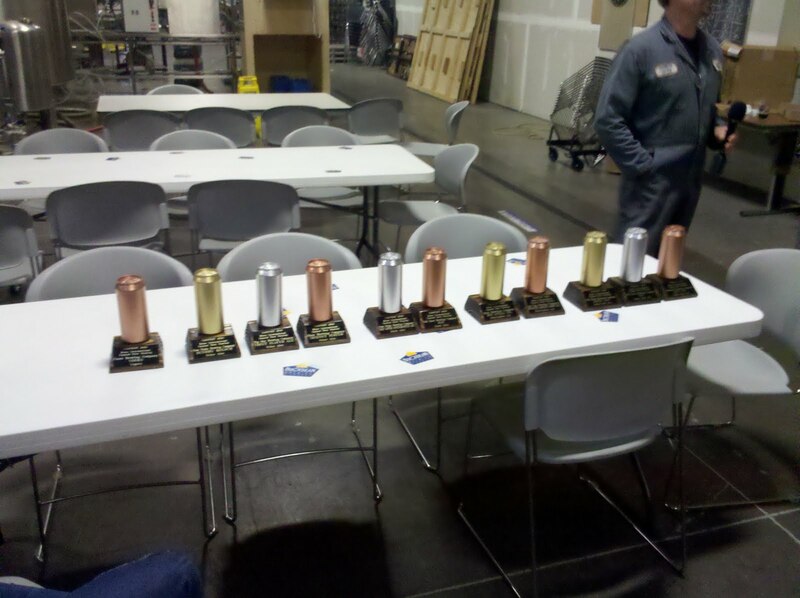 Congratulations to all the winners, especially Tallgrass, a newcomer this year who cleaned up with three trophies! Other big winners (i.e. multiple trophies) included Four Peaks from Arizona, Maui Brewing from Hawaii, and mainstay Oskar Blues from Colorado. I look forward to having all your beers tomorrow. So, the party's over. At the Colorado Convention Center, the last bits of the 2010 Great American Beer Festival are being torn down and packed up. Janitorial crews are scrubbing the floors and walls. Brewery representatives are headed back to their respective cities, and college kids are returning to campus. And bloggers, such as yours truly, are reflecting upon the festival gone by. This was my first GABF, and it won't be my last. My wife and I went for two nights this time around, but I could see myself going for all three. There might be a couple changes to the routine next time around, such as staying within stumbling distance of the convention center and not really trying to explore Denver by foot in between sessions. Also, I may have to sign up for the Brewers Association or the American Homebrewers Association to get into their Member's Only Saturday session or go on Thursday night instead to try and beet the college kids. 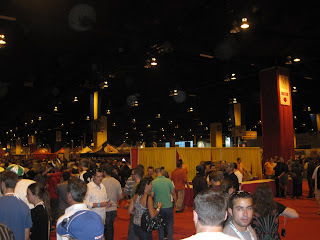 I had many good beers at the GABF, but only a few that I would call amazing beers, and all of them seemed to be from Colorado, a state I've neglected to cover in my reviews thus far. First of all, I fell in love with Wynkoop's Patty's Chile Beer, a 2006 GABF Bronze Medal winner in the Fruit and Vegetable beer category. It had a strong chili pepper aroma without the overt spiciness that I was expecting from a pepper-infused beer. It is one of my new favorites. Also one that I enjoyed was Yak & Yeti's Chai Milk Stout (auto-"corrected" to "Chair Milk Stout" in one of my tweets); I've never tried a beer infused with tea before, but they did a fantastic job. Finally, Rocky Mountain Brewing's Da' Yoopers tasted almost exactly like cherry pie filling. I've never had so many creative beers at one time. Great job all around, guys! Alaskan Brewing Co. - Always great to talk to and support. Another Gold for the Smoked Porter's 2009 edition. Not a surprise there. Trinity Beer Co. - Great IPA out of Rhode Island, which won the Bronze in the Imperial India Pale Ale category. Horseheads Brewing, Inc. (NY) - Another good East Coast brewery, though I can't remember what I had. Blame it on being buzzed. NOLA Brewing (LA) - Great Brown Ale, great people to talk to. Full Sail Brewing (OR) - Dedicated staff, which is what you get when the employees own the place. Redhook (WA/NH) - I toured the Woodinville, WA brewery many times in college. So many fond memories. Passionate about the beer. Shoulda tried the Copperhook, one of my college beers, if they had it. Laurelwood Brewing Co. (OR) - Another Portland brewery that I'd probably be addicted to if I still lived there. Deranger took the Bronze in the Imperial Red Ale category. 10 Barrel Brewing Co. (OR) - So there's apparently more to great Bend beers than just Deschutes. Sold out by the time I got there. Draft only. Last year's Bronze in the Out of Category awards for their S1NIST0R Black Ale. Can't forget Deschutes (OR), also sold out when I got there, but I have a bottle of Abyss waiting for the holiday season. Gold for their Mirror Pond Pale Ale (Classic English-Style Pale Ale), Silver for their Gluten Free beer (Gluten Free) and their Wowzenbock (German-Style Wheat Ale), and Bronze for their Bachelor ESB (Extra Special Bitter or Strong Bitter). Ninkasi Brewing (OR) - Another SOL, but I met co-founder Jamie Floyd. Awesome guy. Can't wait to try some of your beer. Wynkoop Brewing Co. (CO) - The aforementioned Chile Beer is my new favorite beer, and their food ain't bad either. Brooklyn Brewery (NY) - Finally! An east coast brewery doing something interesting that isn't Sam Adams! I took a zymological journey with them and their odd-but-tasty beers. Their Manhattan Project tasted like a Manhattan. Congratulations one and all! I look forward to talking with you in the future. For now, however, I must rest and start another week of work. I am continuing work on the redesign and the migration of this blog as you read, but I felt this entry couldn't wait. So until next time: Prost! P.S. I have to give a big thumbs up to the Reno area's own Great Basin Brewing Co., who took home a Bronze in the Experimental Beer category -- Nevada's only medal! However, there is a fifth thing that is on my list of stuff getting done, one that isn't quite so apparent. I am going to be moving this blog to a new address: www.TheBeerocrat.com! Being the web developer that I am, I am writing the entire codebase and designing the site myself so that I can have complete control over how my site should look, act, and feel. Right now, all going to thebeerocrat.com does is take you back to this Blogspot blog, but that will change in the near future. I have been working behind-the-scenes to get things up and running and integrating it with social media, Web 2.0, and other overused tech buzzwords. For example, all of my established blog posts are now ported over (including all your comments) and my permanent RSS and Atom feeds have been created and tested. And, like everyone these days, I now have a Facebook page and Twitter feed which will be integrated into the site. Hopefully this will mark a positive step for the Beerocrat and its followers. I would like to thank everyone who has helped make this blog the way it is. I also would like to thank Blogger for the more than three years of blogging that I've done. Before getting to the meat of this entry, I want to let you all know to expect a hiatus coming up this week. It was great being able to write some entries during my spring break, but The Beerocrat has to hit the books again this week, so maybe expect one more entry this week, then possibly irregular updates until mid-May. Stumbling along Reno's Irish Row this St. Patrick's Day, I stopped in the King Ranch market to see if I could grab some more Guinness to continue the celebration at a friend's house. I figured they'd have some because everyone's a little bit Irish on St. Paddy's Day, right? Apparently not there; all they had were Latin-American beers and your typical domestic fare. In my semi-drunken state, I remember staring in awe at the number of different countries that were represented, which I guess makes sense, considering it serves a sizable Hispanic population nearby. For some reason, the Honduran beer SalvaVida caught my eye, so I grabbed a 6-pack. Everything except the bitterness, original gravity, hops, food pairings, and awards came from Cerveceria Hondureña's SalvaVida website. I will need to either e-mail the brewery or call/e-mail the U.S. importer for the rest, if they'll give it up. Like most Latin American pilsners, SalvaVida poured a dull golden color into my glass. It had an almost non-existent bubbly white head that dissipated almost immediately. The beer's nose smelt very strongly of hops and metal, once again very characteristic of a pilsner from that part of the world. The taste of the beer was also hoppy and metallic with a malty undertone and a carbonated mouthfeel. At first, the taste was mostly clean and crisp with almost no after taste. However, as I drank more of the beer, it started to taste bitter, and the aftertaste built on itself. With exception of the finish, this beer is largely interchangeable with most other Central American beers I've had, and I imagine if I had some burritas, Honduran tamales, or pastelitos de carne (similar to El Salvadoran papusas, I believe) it may have complemented it better. Still, if you're interested, pick one up at your local Hispanic store. ¡Salud y amor y tiempo para disfrutarlo! Before today's entry, I would like to wish everyone a Happy St. Patrick's Day. Please party responsibly. I got the first brewed, calories, ABV, malts and hops from an MSNBC article on the beer. I'll probably fire off an e-mail to Guinness or Diageo for the rest, but I won't hold my breath. The beer, like every other Guinness product I've had, pours black as night into the bottle. I messed up and poured this beer as I would've poured a Guinness Draught, but it turns out I wasn't supposed to; what little head that resulted was tan in color, a little whiter than the other Guinnesses. The aroma was similar to that of Guinness Foreign Extra Stout: a pleasing dark chocolate nose. The taste of the beer was certainly more carbonated and less creamy than the Draught, with a little more malty flavor. That maltiness lingered slightly in the aftertaste, but it wasn't overbearing. My wife and I took a mini-vacation to the Monterey Bay area for Valentine's Day. When we were in the Cannary Row area, I found a little Mediterranean market that had all sorts of funky Greek, Russian, and North African/Mediterranean foods and drinks. I was fascinated by their beer fridge; in addition to beers from the Baltic region and Greece, I found a beer from Lebanon, so naturally I had to buy it. That beer: Almaza, a pilsner. 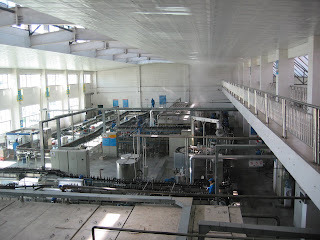 The year comes from the Almaza website, and the (limited) rest comes from the bottle and the importer's website. I think some e-mails are in order. When I poured the beer, a smell I can only describe as "pilsner" emitted from the brew. It was that hoppy metallic aroma that I've smelled in beers from Poland to Honduras. Full disclosure: I'm not a fan of that smell, but I fully support anyone who does. Also for full disclosure: I'm fairly certain the beer smelled funky; I'm not sure how long my bottle had been in the case, and the green bottle doesn't exactly help with UV radiation and hop oil spoilage. The beer had a light golden color with a white head that dissipated moderately quickly. Taste-wise, this beer tasted like a diluted version of Okocim, which was nice; no penny in the taste and a light carbonation. There also was a little skunk in the taste, which I chalk up to the bottle and its unknown age. The finish was a little bit of a sticky hoppy taste, with a slight touch of skunk. I probably would've liked this beer more if it were fresher or newer. I'm sure those people who like pilsners will enjoy this one. Order one from your local Lebanese restaurant in the U.S., Canada, the U.K., France, Australia, or the Persian Gulf. I'm always on the lookout for beers that come from exotic corners of the globe. So when I was reading my September 2009 issue of All About Beer magazine a few months ago, I noticed an ad for a new imported beer from Tibet, called Lhasa Beer. I immediately looked around Reno for the beer, mostly in the Asian markets and at Whole Foods, but I came up empty-handed. Flash-forward to Christmas, when I was visiting family members in Austin, Texas. My wife and I went to the main Whole Foods store there, and while I was looking around, I found that they sold this beer. I had to snag it and bring it back to Reno. *I count Tibet as its own country, even though China technically has administrative control over the region. I would count Taiwan similarly. It's not so much a political thing as it is an "exotic" thing. Information on the first-brewed, malts and hops came from the Ingredients page, the ABV comes from the Beer page, and the award information comes from the Beverage Tasting Institute's review. The remainder of the information came from an interview with management at Dzambuling Imports LLC. The first thing that hit me was this beer's strong pilsneresque aroma as it hit the glass. A deeper smell reveals a hoppy floral bouquet. The beer poured a yellow-golden color with a bright white head. The taste was carbonated and a bit hoppy for a 20 IBU beer. The finish was very crisp and light, leaving no trace of the hoppiness it originally had. Lhasa Beer makes for a drinking experience that you can feel good about, both taste- and karma-wise. Pick one up wherever they distribute it, which will also include Reno and Las Vegas in the near future. Let's go back in time to January 2008. The economy was still somewhat good but about to burst, George W. Bush was still president, Michael Phelps was dreaming of eight Gold Medals in Beijing, and in Reno, a new Ethiopian restaurant, called Zagol, opened up. Me, my wife, and my parents-in-law decided to try it out. The food was interesting, the honey wine was fantastic, and the beer was Hakim Stout, what I called a "surprisingly good beer". Some of the commentors agreed, some didn't, but hey, we all have different tastes, and that's why I never bad-mouth a beer. Now, we come back to the present. Barack Obama is president, Michael Jackson is dead, Alabama won the BCS National Championship game, and the family returned to Zagol for my father-in-law's birthday. Last time, I came with a 1.3 megapixel cameraphone, but this time, I came prepared with a 10 megapixel digital camera. I even knew that I wanted the light beer this time. Problem is, I had no idea what it was called, and neither did our waitress last time. I soon found out it was Harar Beer, a lager from the same brewery as Hakim Stout (thus the brewery info is the same). This beer is brewed in the pilsner style and runs at 4.25% ABV, less than the stout. Like the stout, the name of the beer is printed on the label in English as well as in Ethiopian, with the transliteration of the text being "Harar Bīrā," or (surprise!) Harar Beer. I got this extremely limited information from the bottle. I really need to e-mail the brewery with my questions. Who knows, maybe they'll answer. This beer poured a golden color with a very nondescript white head that faded away almost instantaneously. The beer had a very malty aroma to it, but I thought it was pleasant. The taste was a little sweeter than I was used to for pilsners and was a nice surprise. I tasted malts, slight hops, carbonation, and a citrus taste reminiscent of a hefeweizen. The aftertaste was a combination of hops and slight metal, but faded pretty quickly. Matching the beer with Ethiopian food like Gored Gored and Ya Doro Wat made the aftertaste non-existant. I liked this beer better than the Hakim Stout and better than most other pilsners I've had. Some complain that it's too sweet, but I think it's nice to not have a lager that tastes like I'm sucking a penny. Like Hakim Stout, you can find it at your favorite African restaurant or importer. This is a beer that recently was distributed to the Reno area, or at least to my favorite beer store, Booze Bros. I was in the mood for a Latin American lager, I saw the bottle, I saw the country of origin as another I can check off my list (Guatemala, by the way), I purchased. All information, except for the OG, malts, hops, and serving temp, came from Central Beer's Famosa website; the rest came from an e-mail to the importer, Central Beer Import and Export. The beer itself poured a clear light golden color that bubbled up into a nice clean white head. The scent of the beer reminded me of many a pilsner and Latin American lager I have drank, which makes sense considering this is your basic Latin American lager. The beer itself tasted of carbonation and a slight hoppiness with just a hint of malt. The good news is that the aftertaste was not overly bitter or metallic, a problem that befalls many beers from this part of the world (my theory is that it has to do with the water). It was a light hoppy aftertaste that lingered for a little while. Overall, not a bad beer, but I imagine that the entire experience would be greatly improved served alongside some tamales or chile rellenos or other Guatemalan food (and yes, apparently most Guatemalan food is also Mexican food). Certainly far from the worst Central American lager I've had. Your favorite Guatemalan restaurant or Latin American grocer probably has this beer, so pick one up. When I went to Texas for Christmas vacation, I of course wanted to check out the local beer flare. And in many parts of the state, when it's not one of the Big 3, the two big Texas beers are Lone Star (what one friend in San Antonio called "Texas' Budweiser") and Shiner. I only had one bottle of Lone Star, but I had a fair amount of Shiner, both the flagship Bock (4.4% ABV) and the winter seasonal Holiday Cheer (5.4% ABV). Both beers were very delicious and were highlights of my trip, along with a trip to the Blue Star Brewery and La Tuna for drinks. It was when I got home that I discovered that Spoetzl, the brewery that makes Shiner, celebrated their 100th anniversary this last year, and they released a special beer to commemorate the event, called, er, 100 Commemorator, a Doppelbock-style lager that Spoetzl notes was used as "liquid bread" by monks fasting during Lent. The anniversary of the "little brewery" in Shiner was one of the many that occurred involving beer, including Guinness' 250th anniversary and Rogue's Sesquicentennial Ale to celebrate Oregon's 150th birthday. Since it was only available for the entirety of 2009, I figured that I should pick one up while I can find them in 2010. After doing a little research, I discovered that this is the last of the anniversary beers that Spoetzl brewed. They started in 2006 with 97 Bohemian Black Lager, and followed up with 98 Bavarian-Style Amber in 2007 and 99 Munich-Style Helles Lager in 2008. Too bad I didn't try them when they came out, although I lucked out on the 97, which is back for good. The style, bitterness, and ABV come from Shiner's 100 Commemorator website (What's On Tap → 100 Commemorator). The rest will hopefully come as a response to an e-mail I'm going to send to the brewery. The beer poured a mid-amber color and produced a light tannish foamy head. The aroma was fruity in nature and pleasant to my nose. The beer itself also tasted fruity but also very malty as well, proving the liquid bread reputation this style is known for. The taste also is slightly hoppy and also felt "heavy" and complex, if that makes sense. The aftertaste reminds me of a sweet dark bread, and it was pleasant and non-intrusive. I snagged one from my usual haunt Booze Bros. in Reno, but if you want to grab one, you better do it soon! Copyright © 2007-2019 The Beerocrat. All rights reserved.